I’ve never used a desktop application for managing my emails. But having used Airmail 3 for over months now, I’ve fallen for it. 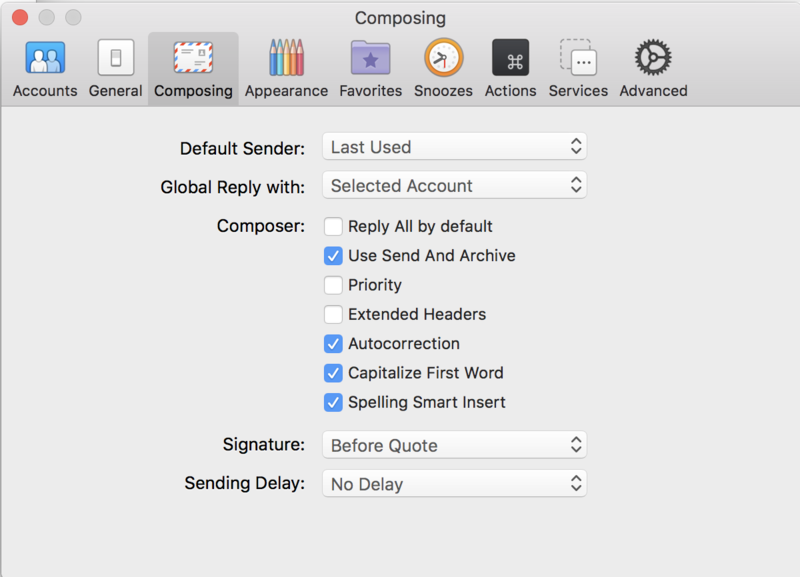 Now I want to tell you all about it in this Airmail 3 review that introduces an email client for Mac that is simple, elegant, to-the-point, and fast. MacBook Pro with Touch Bar works beautifully with Airmail 3. Perfect email client doesn’t exi…. I always thought that desktop email clients were slow and sluggish especially in refreshing fetching new emails as they arrived. I’ve only seen Outlook and Thunderbird being used by others. I’ve never used one for myself. So when I started searching for options — a tedious task in itself — Airmail 3 popped up on multiple reviews. So I gave it a go, and I don’t regret it. Airmail 3 is a lightweight and lightning fast mail client (the latter is the company’s claim, I haven’t had the chance to measure the app speed with lightning) available on the Mac App Store. At a price tag of $9.99, the app isn’t free to use; but you don’t have to break your bank either. And that’s why you should spend the next few minutes reading the rest of the review to see why I’ll be using it on every Mac I have going forward. Upon launching Airmail 3, you are presented with this simple window that asks you to log into your email account. There are plenty of email services that are supported right off the bat. You can log into your iCloud email account as well as Outlook, Google, Yahoo, and any POP3/IMAP email account that you want to sync with Airmail 3. Once you have set up the email accounts, you will be taken to the main Airmail 3 window. I think it looks pretty neat and clean compared to anything else I’ve seen before. 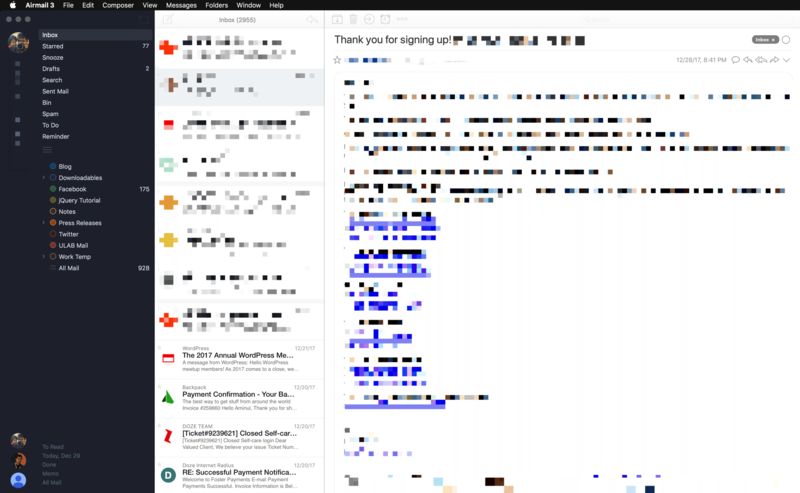 For obvious reasons, I’ve blurred parts of the screenshot; but you can get an idea about Airmail’s layout. On the left lies a list of tabs much like Gmail’s web interface where you can click to see emails that are on Inbox, Starred, Draft, Sent, Bin, or Spam folders. Below that is a list of your custom filters that you have created on Gmail. I haven’t tested this with other email services like Yahoo or Outlook, but I think if you’ve created filters, those will be imported over as well. You may think that it’s redundant to have the Airmail icon show up on both the status menu on the top and the dock at the bottom. But having it show up on both places has an important advantage. Right off the bat, as you can see, I have a familiar interface that has a basic layout similar to what I’m used to for years. If you look at the bottom left corner, you will notice a few circular avatars. They represent the connected email accounts. Right now, I have three email accounts connected to Airmail. So I can switch between those just by clicking on the avatar. Not sure which email account you are seeing? Don’t worry, the email address of the account you’re currently seeing is laid out vertically just below the profile picture on the top left. You can see them in the screenshot. They are blurry (duh!). But what if you don’t want to switch between multiple accounts? What if you want to view everything from a single Inbox? Fear not, Airmail has you covered. If you head over to the Preference window and open the General tab, you will be able to turn on what’s called a Unified Inbox. Some people have the supernatural ability to use something like a unified inbox where emails from multiple inboxes are compiled into a single list. For me, I find it confusing. I like the separation of email accounts. But if you are one of those people with this unusual supernatural ability that makes you ‘capable’ of managing emails from multiple accounts under a single Inbox, Airmail 3 gives you the option. Just head over to the Preference window and click on General tab and you will be able to check the “Use Unified Inbox” option. There are other options for you to change as well. I always keep iCloud Sync, iCloud Preference Sync, Sounds, and Open Links in Background turned on. iCloud sync helps me keep all of the account synced to iCloud. So when I reinstall macOS or get a new Mac and install Airmail, I only need to log into one of my email accounts. The other email accounts are automatically imported although they require individual logins just to be safe. Open Links in Background helps me click links in the email without leaving the Airmail window. It will open the link in the background on your default browser. So when I receive those daily digest emails from work, I can read through them, and click to read more or leave a comment without switching back and forth between Chrome and Airmail. The drop-down menu that is currently set as “Dock + Status menu” decides where the app icon shows up. You may think that it’s redundant to have the Airmail icon show up on both the status menu on the top and the dock at the bottom. But having it show up in both places has an important advantage. With this setting selected, every time you click the Airmail icon on the status menu, the Airmail window shows up. That’s all expected, right? But if you click the icon again, the window hides. That means when I’m working on other windows, I can just click the Airmail icon to have a glimpse or read/send an email from Airmail, and then click the icon again to go back to where I was. No need to minimize or do any more extra mouse movement than necessary. it doesn’t work if you choose to show the app icon only on the status menu. So I set to show it on both, and it works for me beautifully. On the Composing tab of the preference window, there are some more settings related to how you type into the compose window on Airmail. These are self-explanatory, so I wanted to let you take a look at what are the options you can set there. Under the Appearance tab, you can truly personalize how Airmail 3 looks, feels, and to some extent, works. You can see what are the options available for you to change in the screenshot below. I haven’t made any changes to this section. So what you’re seeing is pretty much how Airmail ships by default. But you can edit it to your liking. There’s also a Favorites tab next to Appearance where you can select what folders show up on the top. So, if for whatever reason, you don’t want the “Sent” or “Starred” folder to show up on the top, you can unselect them from there. 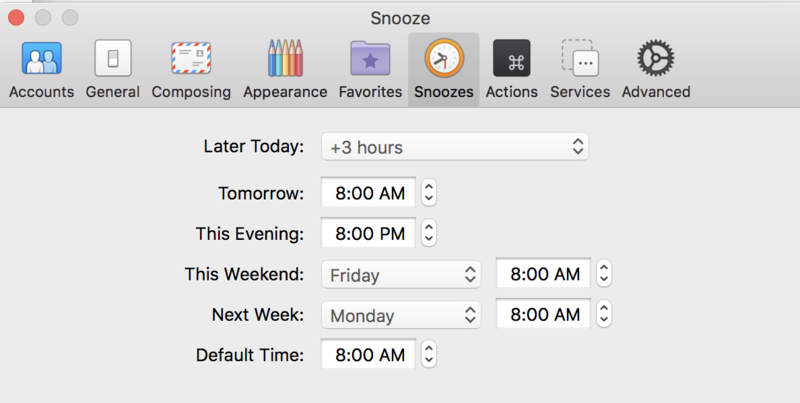 Although it’s just called “Snoozes”, you can set when you don’t want to be bothered by incoming emails. I never use it because I do want to know when an email has arrived. At least, for as long as the computer is turned on, chances are, I’m around. 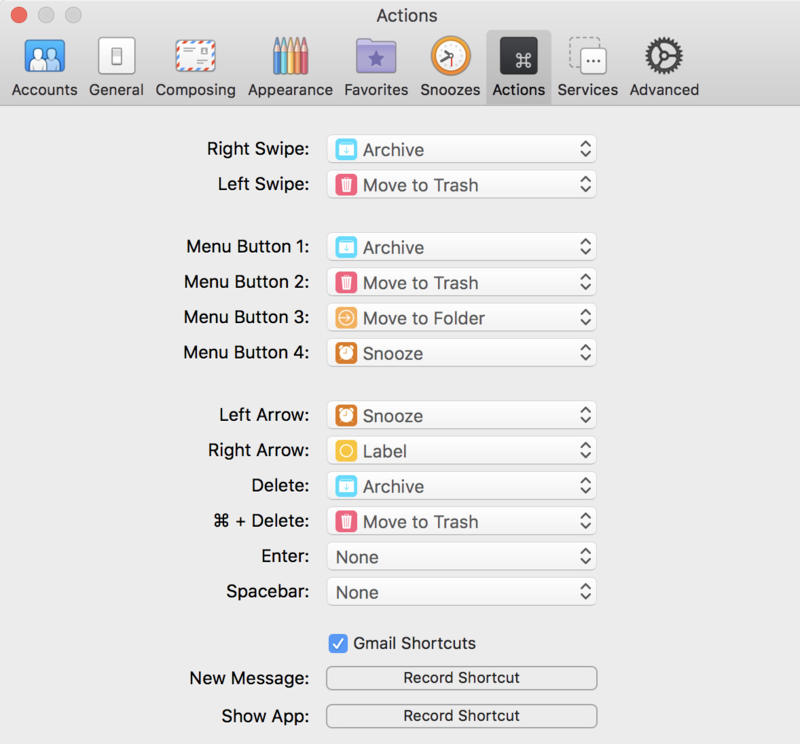 “Actions” is where all the keyboard shortcut ninjas can get their game going. I do use keyboard shortcuts on a number of apps, but I never used any with Gmail web. On Airmail 3, though, I use the mouse or trackpad with a keyboard to move around, and the only shortcut I use is the Command + Delete to move an email to the trash. If you have a 2017 MacBook Pro with Touch Bar, Airmail 3 works beautifully with that. You will have all of those action items right on the Touch Bar, but if I were to be honest, I would say that using the keyboard shortcuts is a much faster process. But if you want a bit of fanciness, Airmail 3 has got you covered. 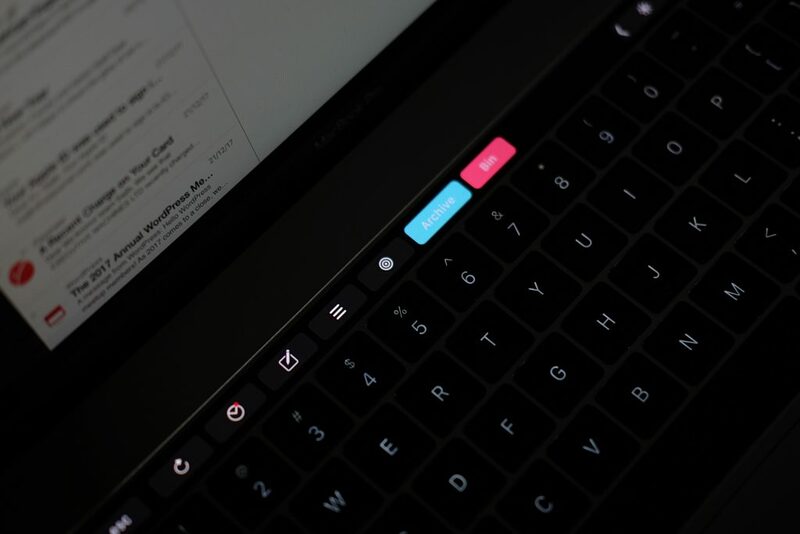 After all, you did pay extra for the touch bar! There are more things on Airmail 3 that you can take advantage of. If you use emails to create tasks — to follow up, to create an event or a reminder and so on — Airmail 3 has that side covered, too! It integrates with some of the most popular services out there. 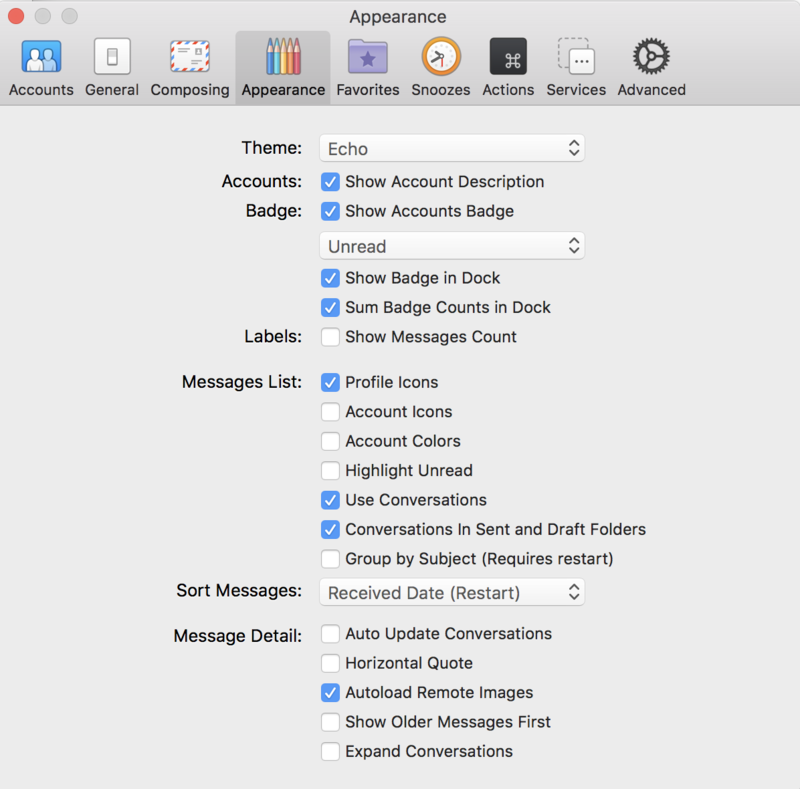 To name a few: Besides Mac’s built-in Reminder and Calendar, Airmail 3 also integrates with Google Drive, Dropbox, OneDrive, Droplr, Wunderlist, Todoist, Box, Evernote, Things 3, BusyCal, Fantastical, Bear, Trello, and Box. There are more integrations including the ability to connect to an FTP server! To see a full list, you can head over to the Preference tab’s Services menu. Switch over to the Advanced menu, and you will find some more options like the toggle for detecting links, dates and phone numbers in messages, turning off advanced graphics if you’re using an old Mac with not-so-powerful hardware, toggle to sync contacts, the ability to change some search settings and more. I love Airmail 3 because it’s a straightforward, neat, and clean email client despite having a lot of features and integration options under its belt. The cool thing about it is that those additional features don’t get in the way. As you saw at the beginning of this review, it starts as simply as possible, with a prompt to add your email account, and it builds up from there. This is a user experience that all app developers should try to follow. Not being overwhelmed with too many options right at the beginning is the best possible experience one can expect. All the cool stuff is still there if I need it. But when my need is limited to just a barebone email client with the ability to manage multiple email accounts, Airmail 3 hides its extra features and gives me exactly just that. Airmail 3 has an iOS app, but I think it’s not worth it. I haven’t used it myself, but the reviews aren’t great. 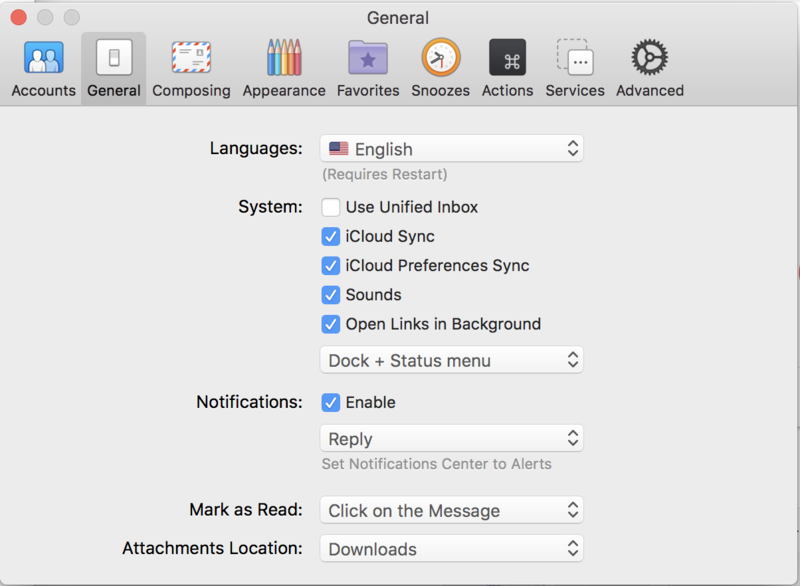 You can find a full list of Airmail 3 features here. To download Airmail 3 from Mac App Store, click here. At the time of this writing, the latest version out there is Airmail 3.5. I hope you found this Airmail 3 review useful. Have you used a desktop email client? Why and why not? What do you think about Airmail having read the review? Are you going to give it a try or are you going to stick to your current email client/web? Let me know your thoughts in the comments. I disagree. The messages list renders in tiny, grey font, impossible to read. Literally hundreds of posts on forums beg the company to fix the problem and they haven’t. It’s ageism and the arrogance of a few young white guys, and I hope they crash and burn for their inattention to the repeated published needs of their clients. I use Airmail on both my 15-inch MacBook Pro and the 27-inch 5K iMac. I don’t have any trouble reading text in it. But I understand different have different experiences with it. In any case, thank you for adding your thoughts! Airmail has stopped working at 100% with iMac, keeps asking for PWD to accounts. No amount of tweaking, re-entering PWD halps, tests always fil. What happened to a once great client? Are you sure this is not the email account that you’re adding that’s causing trouble? I ask because I routinely have trouble with an Outlook email account that keeps asking for the password. I never had such trouble with any of the other email accounts I have on Airmail. I’ve got an iMac too. Snoozing doesn’t prevent mails from arriving in your inbox, it allows you to temporarily move a mail out of your inbox and have it reappear after a set time. Quite useful if you likt o keep a clean inbox or if you want to be reminded of a mail after a while!